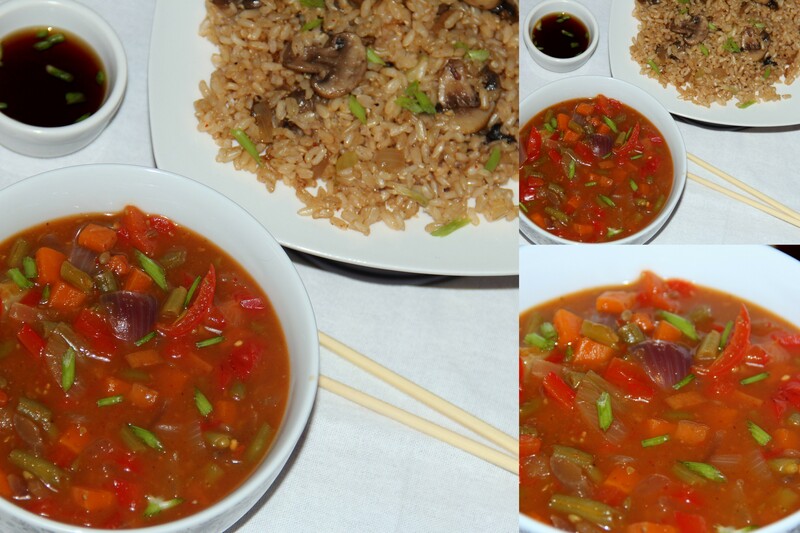 This is a simple and easy indo-chinese vegetable curry which is spicy-tangy taste. I used carrots, bell peppers, french beans, cucumber in this curry with homemade schezwan sauce. Homemade sauce has an advantage of personalising to your taste and it can be prepared 2-3day ahead and stored in the fridge in an air-tight container. Combine red chillies, garlic, ginger, soy sauce, vinegar, white pepper powder, tomato in a blender/food processor and blend to smooth and set aside. Heat oil in a large wok until smoking hot , then lower the flame and add onion and saute for 1-2 minutes. Now add the ground paste, vegetable stock/water and continue to cook on a medium low flame and bring it to boil. Add cornflour-water mixture, salt and simmer for 4-5minutes more/ until the sauce thickens slightly and vegetables are cooked through. Once the desired consistency is obtained turn off the flame and garnish with spring onion greens. Serve with steamed rice/fried rice. Baby corn/mushrooms or any vegetables can be included as per the taste. Spices and sauces can be personalised as per the taste. Tomato puree/tomato ketchup can also be used instead of tomato. Posted on November 7, 2014, in Indian, International, Main Course, Side dish. Bookmark the permalink. 16 Comments. I love all the veggies you have in here and the spice that kicks them up a notch. If I can just get to the cupboard in the public corridor and retrieve my food processor, I’m going to try this one ! !